I have the pleasure of interviewing Björn Jeffery of Good Old (here’s his blog), a Web Strategy show in Sweden. I met Björn (or at least saw him speak) at the Innovation Journalism conference held at Stanford a few weeks ago. We exchanged a few emails and I realized he had some knowledge that would be useful to the Web Strategy community. Jeremiah: You describe yourself as a Internet Strategist, (similar to how I describe myself) how’d you come to this role, and what’s it mean to you? Tell me a bit about your background. Björn: It’s a title that is generally misunderstood I find, but that is probably as it is still relatively unusual. My main focus is convincing executives that their internet policies are of strategic importance. Every company, no matter what their business might be, is in the internet business. Like it or not. And what I do is help my clients to understand that fact, and then how they can use this to develop their business. My background is in media; working as a journalist, editor and an internet developer at several large newspapers. Seeing large publishing houses trying to cope with parallel channel publishing made me realize that this was only the beginning. And I also saw that many of the mistakes that were made were on a strategic level – executives that simply did not understand the digital shift. When this gained on me enough, I quit my job and started the consultancy that I run today. Jeremiah: Being so American centric, I’m very curious to learn about the state of the web industry in Europe. Tell me how things are in your area, what are the hot topics, challenges, and interests? Are things as hyped about Web 2.0 as they are here in Silicon Valley? Björn: The market is a lot more diverse and can’t really be seen as a European whole. Berlin seems to have an emerging web cluster revolving around Plazes, London have Last.FM and a few others, and then there’s Scandinavia that have been most prominent when it comes to mobile development. Jaiku, Kenet Works and Superlocal, to name a few. The general feeling I get is that there is a lot of looking towards Silicon Valley to see what’s working, and what can be implemented over here. Search marketing is not as prominent yet, but growing strongly. Other buzz words are local, mobile, social and geo. Pretty much the same as in the States I would think, but a few months back when it comes to development. Jeremiah: You’ve some interesting clients, tell me Bjorn, what is their level of awareness when it comes to Social media? How about joining the conversation, do they really understand the fundamental shift and disruption? Tell me why? Björn:Their awareness is surprisingly low. So low, it’s a reason for concern actually. A lot of the companies that I meet have just about heard of blogs, but think they are just a way for people to talk obsessively about their pets and stuff like that. And if they’ve heard of UGC they think that they can fire some staff and get people to work for free instead. So those two things are the first that I have to break down for them. On the other hand, once I start giving them examples of what is going on, they seem to get it some what. Unfortunately, vision isn’t as good a driver as fear is. Therefore only business seeing a dropping market share/profit margin tends to act on it. At the moment, media companies fit that bill perfectly, but it won’t be long until finance and insurance will see the same development in their sectors. Jeremiah: Sounds like you’ve got your work cut out for you for some time. As an internet services and solutions firm, what trends are you noticing in the market? What are clients asking for? 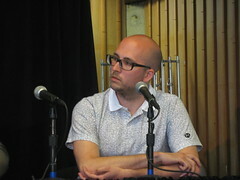 Björn: There seems to be a large interest in alternate channels of communication. Both running blogs parallel to regular websites, as well as letting customers get in contact with them in the way they want. IM, chat, texting – whatever way they want to get in touch, it should work. And it should work at any time, and from any place. Clients of mine seem to be getting this through watching their teens, and the way they communicate. Jeremiah: It sounds like you’ve got quite a few vehicles to choose from, so tell me about this SecondLife case study that your firm did, why’d you do it, what were the objectives and how’d it turn out? Björn: We launched the Swedish daily newspaper Sydsvenskan in Second Life, as the first large company entering in Sweden. The lesson to be learnt here was mainly for the newspaper themselves. They needed to start thinking about how people are socialising today, and in what manner media companies can be relevant for these people. Following that line of thought, we figured that the best way of learning anything is by participating. So we opened up an island and then asked both the employees and the local community what they thought we should be doing. A bunch of other companies and organizations contacted us straight away so now we’re putting it all together. Anyone that adds value in some way can be a part of it. The island is far from finished but it’s growing, slowly but surely. And it definitely put the question of the future of publishing on the agenda in a major way. I think it was a big success. Jeremiah: You are a co-founder of Good Old in Sweden, what’s so “good” and “old” about it, what do you guys do? Who are some of your clients? Björn: It’s a silly name really – but we wanted it to sound like “Ye Olde Pub”, that sort of thing. Anything with “old” in it sounds a bit more credible we thought. And considering that we’re pretty young as a company and only work with really new stuff, the name turned out to be quite a good joke. Well, a joke at least. On a more serious note, we are a communication agency helping companies understand and implement social media and current web trends. We do both advisory and strategic work for executives, as well as design and development if that is needed. We do a lot of work for Bonnier, a large company group here. Both Bonnier Newspapers and Bonnier Magazines, the latter being the ones that recently bought Time Inc. We’re just now looking to see it what direction we should be expanding – there are so many interesting areas to work with at the moment. Making a completely new banking system would be such an amazing challenge for instance, I would love working on a project like that. Jeremiah: Bjorn, thanks so much for sharing with the web strategy community, it’s appreciated. I interview folks on Video, Text, or Ustream, depending on the situation, location and need. If you enjoy text based interviews, check out this one with Bryan Rhoads, Intel’s Web Strategist. I’ve notice quite a few posts about blog design recently, from these 10 beautiful blog designs, from these 45 selected ones, I’m impressed with what Ars Technica has recently done. One thing for sure is that everyone wants to have a great blog design. I’ve had similar discussions with Hyku’s Josh Hallett, well known blog designer among the tech blogosphere. Even with RSS being a common way how people read your content, having a web or blog design that represents you is important. This is why USA Today and other newspapers are undergoing massive web redesigns to meet the changes of social media. I’m frequently asked by contacts, friends, and family to provide recommendations for web designers as well as web design pricing. Since the answer always “depends” I’m going to link to a few resources that will help those that want to know more learn about what to look for in web design, service, and what to expect for pricing. One can never put a price on having a storefront on the web, it’s something necessary for the smallest of businesses, doing it right, or doing it so it matters is a completely different discussion. An over simplified view of web design, if you’re expecting to piece together a web strategy this way, your website will reflect the attention you’ve put into it. Somewhat related in a humorus way, this list of web design punishes the ignorant client, personally, I’d rather inform and educate them, isn’t that why they called you? It’s tagged “humor” so I get the joke. Leave a comment if you’ve other resources for either clients or designers should know about pricing web design services. If you’re seeking a Web Design company, see this list here. If you’re a Web Design company, feel free to leave a comment promoting your work on this post.